Many people perceive a ringing in their ears when no sound source is present, a condition known as tinnitus. By mapping tinnitus inside the brain, scientists have shown just how complex these phantom sounds really are. Tinnitus is a natural consequence of aging. As the hair cells that convert sound waves into neural signals gradually wear out, the brain adjusts to the loss of sensory input by boosting certain types of activity, resulting in the perception of sounds that aren’t there. This condition can be accelerated by frequent exposure to loud sounds, and by neurological damage, ear infections, foreign objects, excessive wax in the ear, and even emotional stress. It’s typically described as ringing, but for some it sounds like hissing or roaring. Sedley’s team mapped tinnitus across the entire brain of a patient undergoing surgery to treat his epileptic seizures. After being hooked up to 164 cranial electrodes, the scientists induced tinnitus in the patient with sounds. The researchers were working to pinpoint the source of his epileptic seizures, providing an unprecedented opportunity to study tinnitus at the same time. It’s the first time this particular network has been mapped in such detail. The researchers caution that the data were produced from a sample size of one, and that the patient may be a unique case; and indeed, tinnitus is expressed differently in virtually everyone. 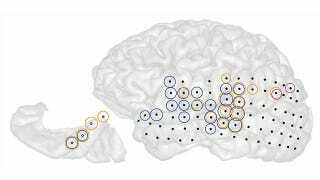 At any rate, the study is offering some important clues as neuroscientists work to understand more about the condition and develop potential treatments. More at the BBC. And read the entire study at Current Biology: “Intracranial Mapping of a Cortical Tinnitus System using Residual Inhibition”.